I hope you've had (or are still having) a great weekend. Wish it was still Christmas....I miss the happy colours and twinkling fairy lights on dull days like we've had today. Roll on spring with its sunny days and cheery colours! I made this card a few weeks ago prior to my son's driving test. I can't believe he's all grow'd up...life is flying by. 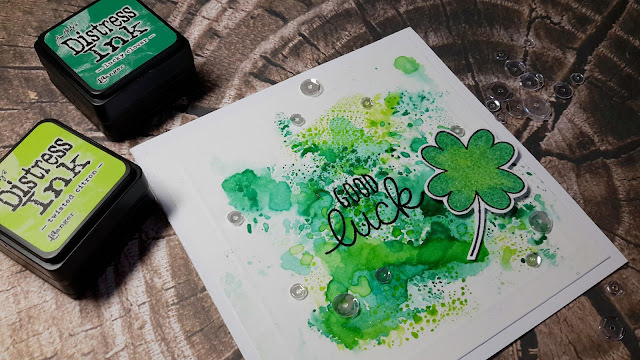 I used the 'Lucky' stamp set from MFT and Lucky Clover & Twisted Citron Distress Inks to 'smoosh' a background pattern. 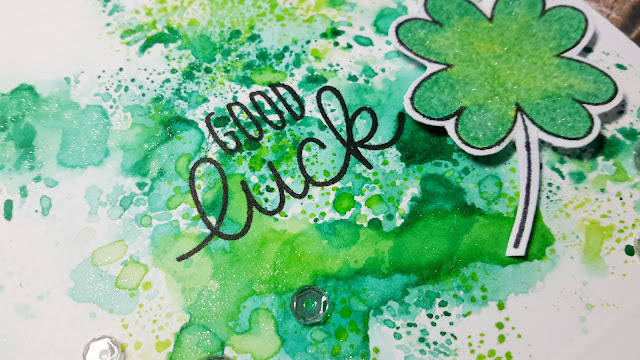 Alas my card was a disaster on the 'Good luck' front as he failed his test, so we tore it up, he re-took his test and passed...Yay! I had fun making it and he appreciated the thought, so that's all that count. Have a fabulous week and I'll be back soon.